Bruno Liljefors's "Cat with European green woodpecker"
Bruno Liljefors "Cat with European green woodpecker" (detail). Bruno Liljefors "Cat with European green woodpecker"
Signed Bruno Liljefors and dated -90. Oil on canvas 70 x 105 cm. VIEWING: 1 – 6 June. OPEN: Mon–Fri 11–18, Sat–Sun kl 11–17. June 6 open: 11–18. 472. 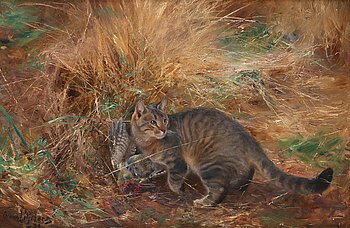 Bruno Liljefors, Cat with European green woodpecker.